Copying blog posts or articles from sites/blogs on internet is a usual thing.Here i am going to share you how to protect your blogger posts/articles form getting Stolen.This is a trick to lock your text and the visitors of your blog can't select the text only they can read the text. 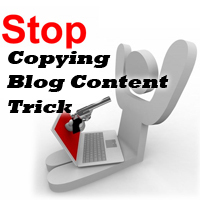 If they cracked that method and select the text there is another trick to disable right click menu,so they can't copy text.a lot of other tips and tricks like how to add more blogger widgets, add social book marking baar, add new sidebar, add facebook lik box , post google adse inside or below the post title , google adse between post,Horizontal manu bar for blogger, image slider for blogger.Please keep wathcing www.bloggingtrainings.blogspot.com flash for blogger templates, and a lot of other tricks for blogger users. A lot of other tips and tricks like how to add more blogger widgets, add social book marking baar, add new sidebar, add facebook lik box , post google adse inside or below the post title , google adse between post,Horizontal manu bar for blogger, image slider for blogger.Please keep wathcing www.bloggingtrainings.blogspot.com flash for blogger templates, and a lot of other tricks for blogger users.